You can purchase the Kids' Wings 21-page Kids' Wings Unit for A Single Shard by Linda Sue Park NOW for immediate download for only $13.95! Click Here to purchase and download the Kids Wings unit for Crispin through Teachers Pay Teachers. Tree-ear, an orphaned Korean boy in the 15th Century, lives under a bridge and depends upon the local dumping ground for food. With the help of his old friend, Crane-man, Tree-ear grows in wisdom, character, and dreams. To become the apprentice to the grumpy, often abusive master potter Min is more than he could ever hope for. Yet, through a fortunate accident, sacrifice, and hard work, this door is opened to him. Will Min ever allow to Tree-ear to make a pot? Can Tree-ear accomplish the enormous challenge placed upon him? 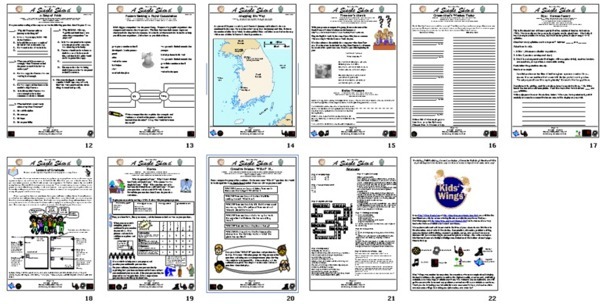 The Kids Wings 21-page literature guide perfect for lesson plans, handouts, or projection on your SmartBoard for A Single Shard by Linda Sue Park is now available for only $13.95! Single Shard is only one of the 20 literature guides for award-winning novels and intermediate-level picture books in Treasure Trackers! You can either order a single unit for about $15.95 or order Treasure Trackers and get 20 units like A Single Shard for just over $1 each! Buy A Single Shard by Linda Sue Park NOW! 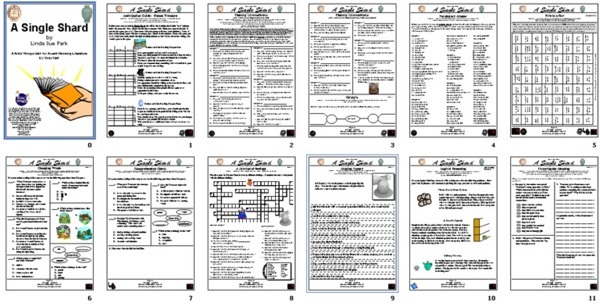 Interdisciplinary Learning Units for Grades 3-7 are available in TREASURE TRACKERS!